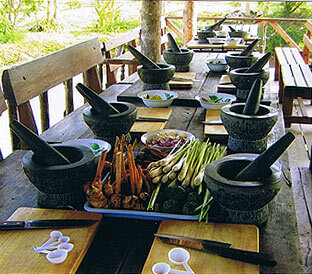 The Thai Farm Cooking School has been open since the year 2000 and is owned by Sawat and Nathalie. Most of the trees are planted by Sawat, who is very passionate about farming. The farm was a ricefield in the past and has now become a paradise of trees like mango, rose apple, malay gooseberry, jackfruit, banana, guava, star fruit, coconut, lime, pomelo, rambutan, … . Not to forget the vegetable garden with lemon grass, galangal, chili, basil, cucumber, morning glory, beans, coriander, bottle gourd, spring onion, ginger and more. A great opportunity for visitors to learn more about the ingredients while cooking tasty meals! WHY WE ARE DIFFERENT THAN OTHER COOKING SCHOOLS? We are the only cooking school who has its own farm. Only here you will see how vegetables, fruit and herbs grow. You will pick them fresh and you will learn more about all the different ingredients. We grow everything organically, which means that you will stay more healthy if you cook with our organic ingredients. Visiting our farm means also that you will get out of the busy city for a day. You will enjoy to prepare your food while being in a beautiful environment. You will get the opportunity to see the non-touristy countryside and you will learn more about country life. without sharing the equipment. We have build our kitchen out of teakwood and bricks. Our staff cleans the kitchen every day in order to maintain a hygienic standard. Sawat, owner and teacher, has stayed for long time in New Zealand and Europe. His English is of a high standard. While being in western countries, he enjoyed cooking Thai food for his hosts. Therefore he had to go and find substitutes for some Thai ingredients. Get helpful ideas from us during class. Sawat and Nathalie have two daughters Demi and Emma. They both love to help on the farm and like to water the plants and grow small trees. You can see them running around the farm on their days off from school. Sawat got his experience as a chef at different restaurants. During the time he was a trekking guide he noticed tourists were really interested in helping preparing food with him in the evening. His family lives in the North East of Thailand and are rice farmers. His passion for food and farming makes that he loves what he is doing every day. Fortunately they have a great staff that helps them all through the year. Besides the Thai cookery instructors they get help from six cookery assistants for cleaning the kitchen and preparing ingredients.